2. 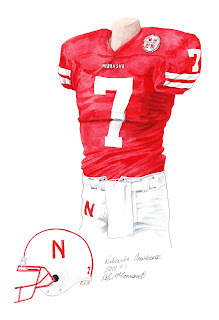 Please note that all of the actual original, one-of-a-kind artwork of the University of Nebraska football uniforms as seen in the poster above are actually available for sale. These watercolor paintings are truly beautiful, original watercolor paintings, and there are only 12 of them so please act quickly if you would like to buy one. These would make a wonderfully memorable, beautiful and completely unique gift for someone who loves Nebraska football. If you would like more information about this great artwork including the three ways you could purchase each piece, please visit our Nebraska YouTube video at www.youtube.com/watch?v=Si9wXqoiavg or go directly to the artwork website www.heritagesportsart.com/Nebraska-Cornhuskers-c87/ where you can see and purchase the artwork. The University of Nebraska (formally known as the University of Nebraska-Lincoln) is a land-grant university located in Lincoln, Nebraska - a few blocks north of the state capitol. Founded in 1869, the university is listed as a Carnegie Research I institution and possesses two campuses: City Campus (the main campus) and East Campus (originally purchased for use as the university farm). 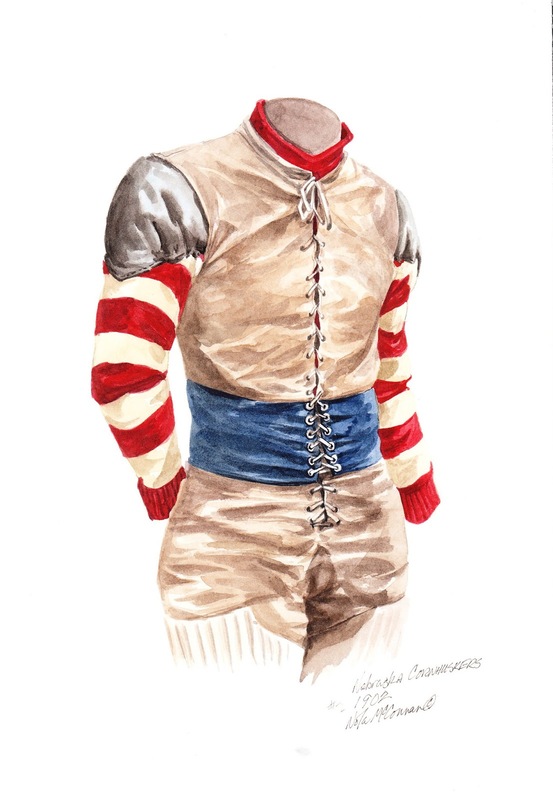 The first football season was 1890 when the team went 2-0. The Cornhuskers football team plays out of Memorial Stadium, which was built in 1923 and seats 73,918 spectators. The University of Nebraska boasts an excellent tradition of football success; countless Cornhuskers have extended their football careers in the NFL, Arena League and the CFL. Notable Cornhuskers alumni include: Tom Novak, Wayne Meylan, Johnny Rodgers, Mike Rozier, Dean Steinkuhler, Tommy Frazier and Eric Crouch. If Nebraska was nationally ranked in "The Top 20" (or Top 10 in some years) in a particular season depicted in the poster, we show the team’s ranking. That being said, prior to 1936 there was no nationally recognized poll ranking the nation’s top teams, so you will not see any rankings prior to 1936. 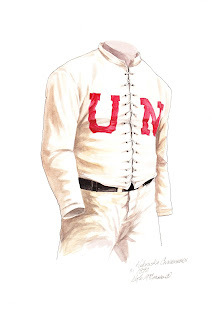 This painting honors the 1890 University of Nebraska football team and their inaugural season. Coached by Dr. Langdon Frothingham, and captained by Ebenezer Mockett, the 1890 team went undefeated at 2-0. Albert Troyer was initially elected as captain, but after sustaining an injury, would be forced to continue on as Manager. 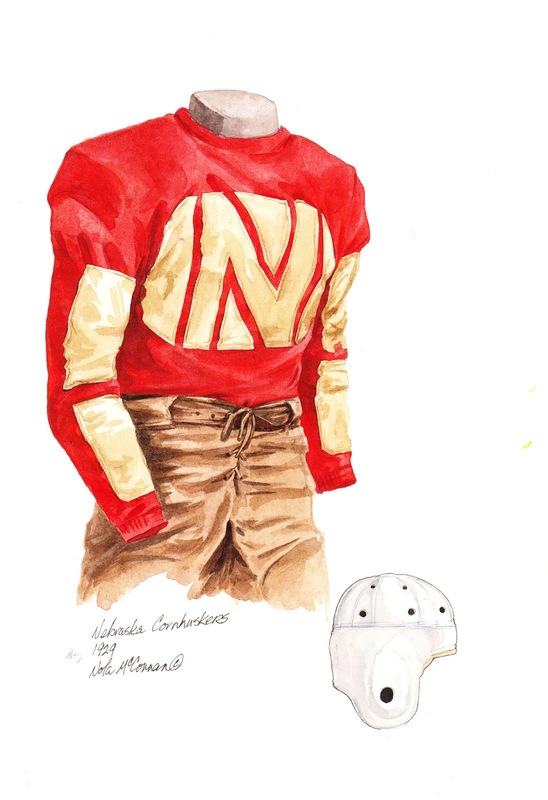 The team would be known throughout the first decade of play as: the "Old Gold Knights", the "Antelopes" and the "Bugeaters", before the 1900 team would adopt the traditional "Cornhuskers" nickname. This painting honors the 1902 University of Nebraska football team. 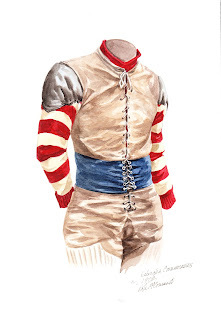 Coached by Walter "Bummy" Booth, captained by Tackle John Westover and featuring Quarterback Maurice Benedict, the 1902 team went undefeated at 9-0, outscoring their opponents 186-0. This painting honors the 1929 University of Nebraska football team. Coached by Dana X. Bible and captained by Halfback George Farley, the 1929 team went 4-1-3. 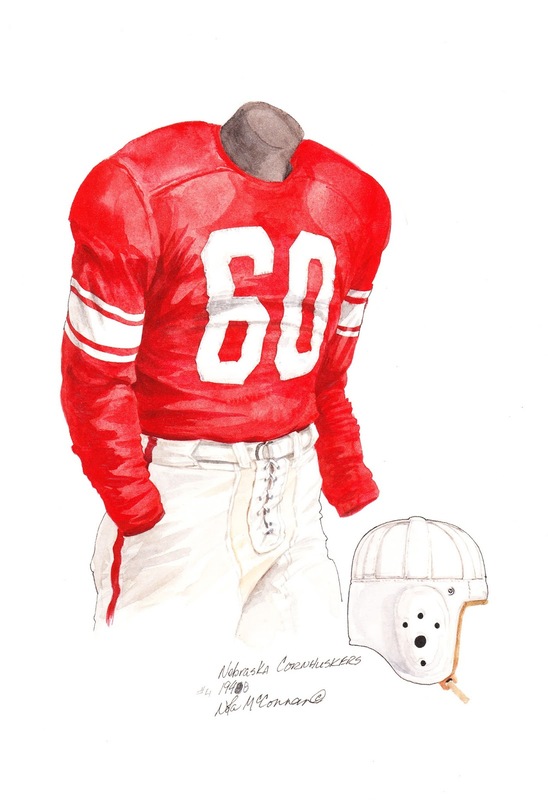 This painting honors the 1948 University of Nebraska football team and #60, worn by Tom Novak. Coached by George "Potsy" Clark, the 1948 team went 2-8. 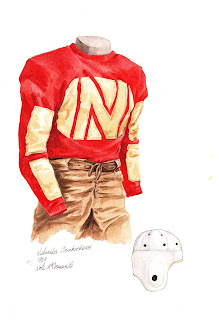 Of special note, during the 1930-49 seasons, Cornhusker captains were appointed each game. 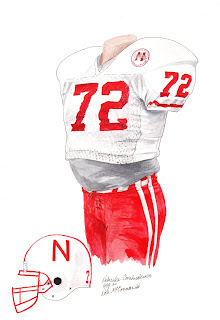 Tom Novak, also known as "Train Wreck", was a Center and Linebacker for the University of Nebraska. A ‘two-way’ player, Tom was Nebraska’s only 4-time All-Conference selection and is one of two Cornhuskers (Bob Brown, No. 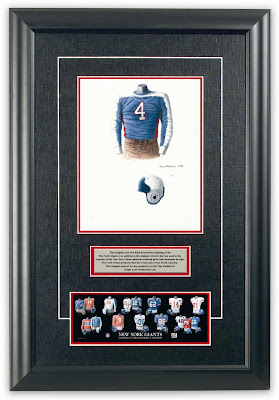 64) to have his jersey number permanently retired - an honor bestowed after the 1949 season. Novak’s football accomplishments also included All-Big Seven honors as a Fullback (1946) and three-time All-Big Seven honors as a Center (1947-49). Tom was named All-American in 1949, played in the East-West Shrine Game and the 1950 College Football All-Star Game. A well-rounded athlete, Tom was also a three-time ‘letterman’ in baseball from 1948-50. 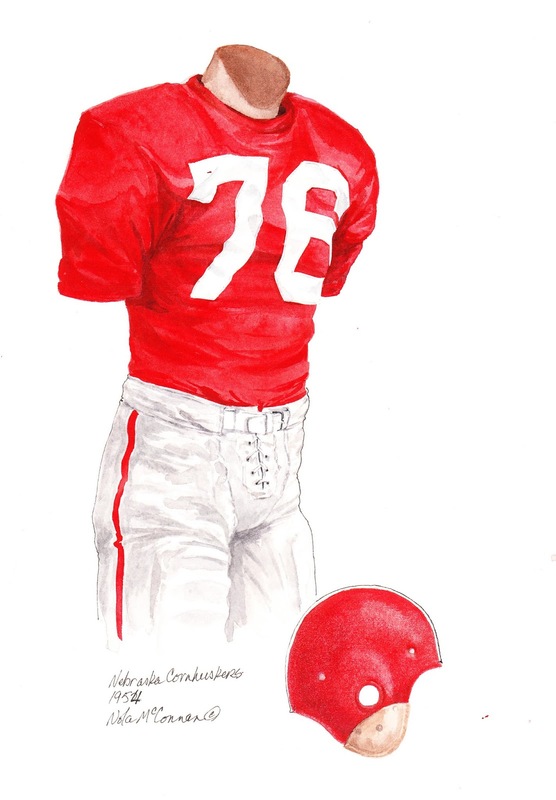 This painting honors the 1954 University of Nebraska football team and #76, worn by Jerry Minnick in prior seasons. Coached by Bill Glassford, the 1954 team went 6-5 on the year - losing to Duke 34-7 in the Orange Bowl. 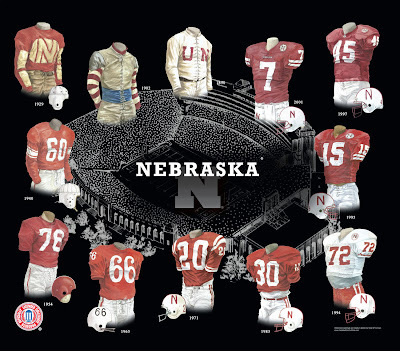 Of special note, during the 1954-57 seasons, Cornhusker captains were appointed each game. Jerry Minnick was originally a Fullback for the University of Nebraska, before converting to the Tackle position during his freshman year. Throughout his Cornhusker career, Minnick’s impressive tackle play would not only garner him a selection as All-American (as a junior in 1952), but would also help Nebraska develop an improved pass-rush. As a co-captain in his senior year (1953), Nebraska’s staunch defense would hold opponents to only 82.1 yards per game through the air, enabling the team to finish 2nd in the Big Seven Conference. He is a member of the Nebraska Football Hall of Fame. 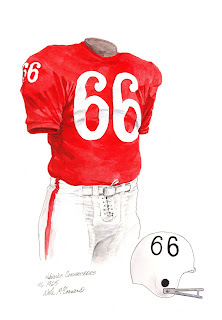 This painting honors the 1965 University of Nebraska football team and #66, worn by Wayne Meylan. Coached by Cornhusker icon Bob Devaney and co-captained by Mike Kennedy and Frank Solich, the 1965 team went undefeated in the regular season before losing to Alabama 39-28 in the Orange Bowl. Their final record was 10-1. Following his career at the University of Nebraska, Wayne played for the Cleveland Browns and the Minnesota Vikings, before returning to the university to finish his studies. He created Meylan Enterprises, based in Omaha and had a penchant for flying World War II planes in air shows - which tragically, led to his death in 1987 - when his plane crashed in a show in Michigan. Here is what our friends at Wikipedia have to say about Wayne Meylan. This painting honors the 1971 University of Nebraska football team and #20, worn by Johnny Rodgers. Coached by Cornhusker icon Bob Devaney and co-captained by Jerry Tagge and Jim Anderson, the 1971 team went an undefeated 13-0, en route to winning the second of back-to-back National Championships. 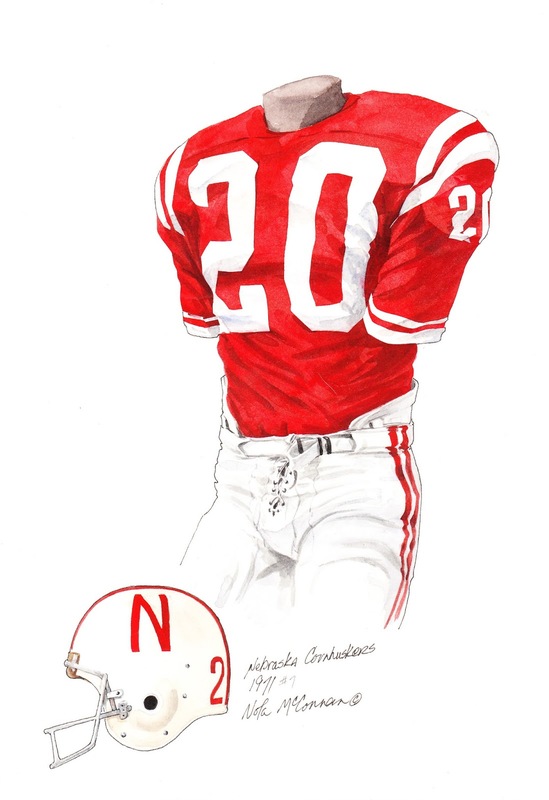 Johnny Rodgers, also known as the "Jet", was a Halfback/Wingback for the University of Nebraska and a staple in Coach Bob Devaney’s offense - helping lead the Cornhuskers to three Big 8 Conference titles and back-to-back National Championships in 1970 & 1971. A two-time All-American known for his rapid acceleration and speed, he also excelled on kick returns and receiving. Rodgers’ tremendous 1972 season included winning ABC’s Player-of-the-Year, the Walter Camp Award and the Heisman Trophy - awarded to the outstanding intercollegiate football player in the United States. In the 1972 Orange Bowl against Notre Dame, Johnny scored 4 touchdowns and threw for a fifth - leading the Cornhuskers to a 40-6 victory. Following his career at the University of Nebraska, though drafted by the San Diego Chargers, Johnny opted instead to sign a lucrative contract with the Montreal Alouettes of the Canadian Football League (CFL). Known as the "ordinary superstar" during his CFL playing days, Rodgers won the Most Outstanding Rookie Award in 1973, the Jeff Russel Memorial Trophy twice and helped lead the Alouettes to the Grey Cup championship game in 1974. He played a total of 4 seasons for the Alouettes before heading to the NFL and signing with his original draft team, the Chargers. His brief NFL career was marred by hamstring ailments - with a freak knee injury (sustained in practice) ending his professional football career in 1978. He was elected to the College Football Hall of Fame in 2000. He was recognized as the 44th best College Football Player of all time by the College Football News in their 2000-ish ranking. He went on to the CFL where he played for 4 seasons. Here is what our friends at Wikipedia have to say about Johnny Rodgers. 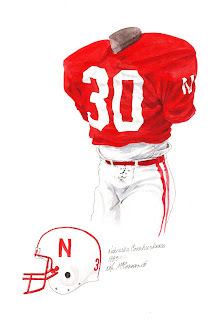 This painting honors the 1983 University of Nebraska football team and #30, worn by Mike Rozier. Coached by Cornhusker icon Tom Osborne and co-captained by Turner Gill, Mike Keeler, Dean Steinkuhler and Mike Tranmer, the 1983 team went 12-1. Mike Rozier was a Running Back/I-Back for the University of Nebraska, who, in 1983, became the Cornhuskers’ 2nd Heisman Trophy winner - awarded to the outstanding intercollegiate football player in the United States. Rozier’s tremendous 1983 senior year saw him rush for a school record 2,148 yards and 29 touchdowns (all via the ground - an NCAA record) and his 174 total points were both Nebraska and Big 8 records. His Cornhusker career marks of 4,780 rushing yards (school record) and 52 touchdowns (2nd to Eric Crouch’s 59) and 312 total points (2nd to Eric Crouch’s 368) were all Nebraska records at the time. Following his career at the University of Nebraska, Mike played in the United States Football League (USFL) for 2 seasons before contraction issues allowed him to join the NFL as a free agent. He signed with the Houston Oilers and played the majority of his 7-year career with them, before closing it out with the Atlanta Falcons. There are some in football circles that feel Rozier’s severe ankle injury suffered in the Orange Bowl on January 2, 1984 never fully healed - prohibiting him from reaching his full potential. At the time of his injury in the 3rd quarter, against a staunch Miami running defense, Rozier had accumulated 147 yards on 26 carries. He was elected to the College Football Hall of Fame in 2006. He went on to the USFL where he played for 2 seasons. Here is what our friends at Wikipedia have to say about Mike Rozier. 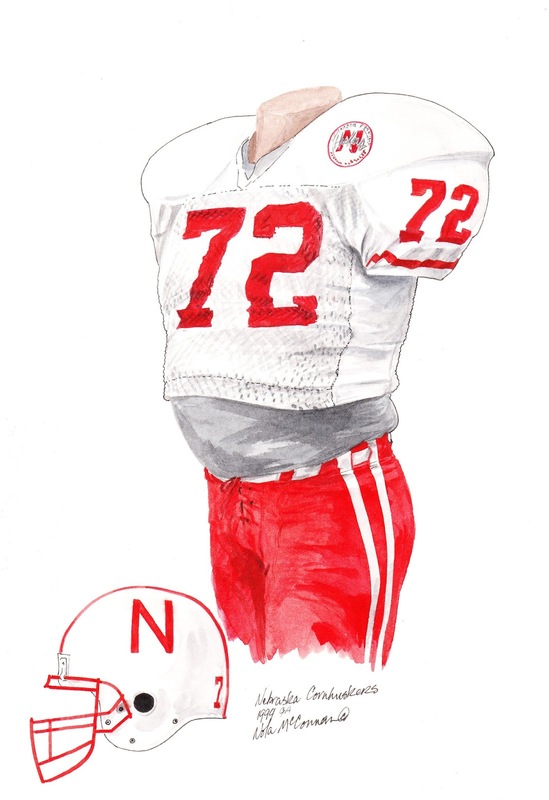 This painting honors the 1994 University of Nebraska football team and #72, worn by Zach Wiegert. Coached by Cornhusker icon Tom Osborne and co-captained by Wiegert, Terry Connealy, Ed Stewart and Rob Zatechka, the 1994 team went an undefeated 13-0, en route to the first of back-to-back National Championships. Following his career at the University of Nebraska, Zach played in the NFL for the St. Louis Rams, Jacksonville Jaguars and Houston Texans. His NFL career can be seen here. Here is what our friends at Wikipedia have to say about Zach Wiegert. 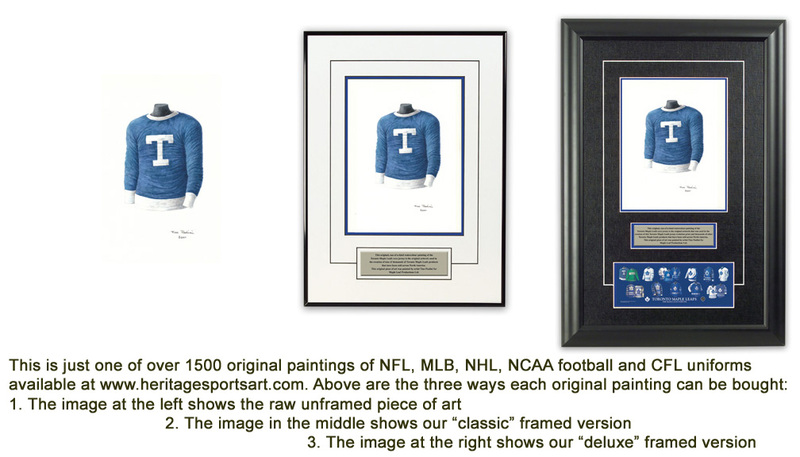 This painting honors the 1995 University of Nebraska football team and #15, worn by Tommie Frazier. Coached by Cornhusker icon Tom Osborne and co-captained by Phil Ellis, Aaron Graham, Mark Gilman, Christian Peter and Tony Veland, the 1995 team went an undefeated 12-0, en route to the second of back-to-back National Championships. Tommie Frazier was a Quarterback for the University of Nebraska - winner of the Johnny Unitas Golden Arm Award. From 1992-95, the Cornhuskers appeared in 4-straight National Title games, with Frazier being named MVP in the 1993-95 games. 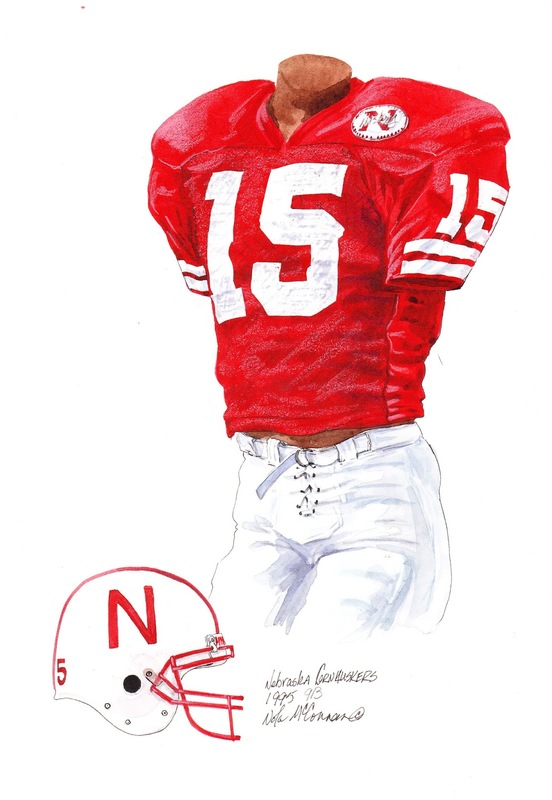 In his sophomore season (1993), in a thrilling 18-16 loss to Florida State, in the game’s final 21 seconds, Tommie would help lead the Cornhuskers in a last second charge - only to be thwarted by a missed field goal. In a 1994 24-17 win over Miami, Frazier helped the Cornhuskers overcome a late 3rd quarter 17-7 deficit, to secure Coach Osborne’s first National Championship. In the 1995 title game, a 62-24 manhandling of Florida, Frazier threw for a touchdown and ran for 2 others - accumulating 199 rushing yards in the process. A late 3rd quarter 75-yard run (where he would break multiple tackles), was the highlight of the game. Following his career at the University of Nebraska, Tommie entered the coaching ranks - serving as an Assistant Coach at Baylor University and Assistant Director of Athletic Development at his alma mater, before becoming Head Coach at Doane College (located in Crete, Nebraska) in 2005. After going 3-17 in his two seasons, Frazier’s tenure at Doane came to a close in November of 2006. He was recognized as the 33rd best College Football Player of all time by the College Football News in their 2000-ish ranking. Here is what our friends at Wikipedia have to say about Tommie Frazier. This painting honors the 1997 University of Nebraska football team and #45, worn by Joel Makovicka. Coached by Cornhusker icon Tom Osborne and co-captained by Vershan Jackson, Jason Peter, Aaron Taylor and All-American End Grant Wistrom, the 1997 team went an undefeated 13-0, en route to their third National Championship in 4 seasons. All-American, the 6’1", 230 pound back could bowl through opponents, gain tough yardage and score when called upon (including 3 touchdowns against the Oklahoma Sooners in a 69-7 drubbing). His selfless blocking also allowed fellow Cornhusker offensive stalwarts QB Scott Frost (shown above) and I-Back Ahman Green to excel on the gridiron (Green set an FedEx Orange Bowl record on January 2, 1998 with 206 rushing yards). Following his career at the University of Nebraska, Joel was drafted by the Arizona Cardinals in the 4th round and played his entire NFL career with the team. Here is what our friends at Wikipedia have to say about Joel Makovicka. This painting honors the 2001 University of Nebraska football team and #7, worn by Eric Crouch. Coached by ex-Cornhusker Frank Solich and co-captained by Crouch, Keyuo Craver, Jeremy Slechta, Dave Volk, and Tracey Wistrom, the 2001 team went 11-2, tying for 1st in the Big 12 North. Eric Crouch was a Quarterback for the University of Nebraska. 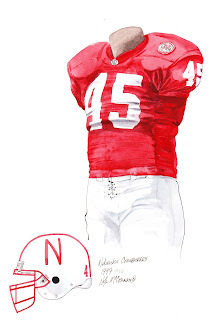 In 2001, he not only became the 3rd Cornhusker in school history to win the Heisman Trophy - awarded to the outstanding intercollegiate football player in the United States, but was also named the Walter Camp Player-of-the-Year, the Davey O’Brien Quarterback Award winner and the USA Today Nebraska Player-of-the-Year. In that 2001 season, Eric completed 105 of 189 passes for 1,510 yards and 7 touchdowns and rushed for 1,115 yards and 18 touchdowns. Widely regarded as one of the best ‘option’ Quarterbacks in college football history, when Eric wasn’t throwing (or running himself), he was handing the ball off to RB Daharan Diedrick (shown above). Crouch was one of three Quarterbacks in NCAA record books to post career numbers of 3,000 yards rushing & 4,000 yards passing. At the completion of his Cornhusker career, Eric held 21 school records - including 59 rushing touchdowns (an NCAA record for rushing touchdowns by a QB) and 312 total points. Following his career at the University of Nebraska, Eric was drafted by the St. Louis Rams as a Wide Receiver. He spent the 2005 season playing for the Hamburg Sea Devils in the NFL Europe League, before playing with the Toronto Argonauts of the Canadian Football League(CFL). Here is what our friends at Wikipedia have to say about Eric Crouch. 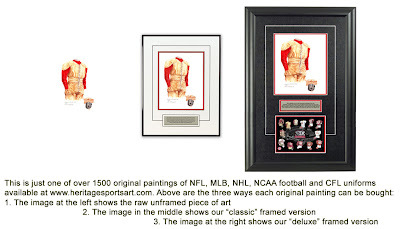 If you love the University of Nebraska and the history of Nebraska football, you might really love to own an original piece of artwork celebrating the team's historic uniforms as seen in the poster at the top of this blog - you can actually own one of those original pieces of art! There are only 12 pieces of original art available for sale, and when these 12 are sold, that's it, they're all sold out. 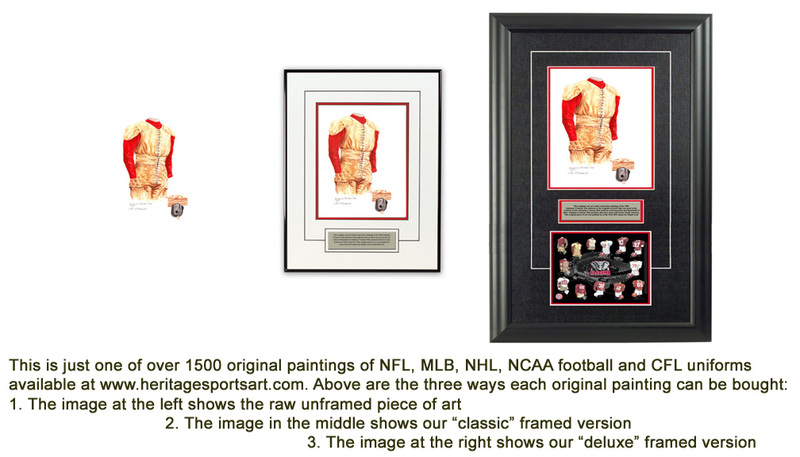 If you would like more information about this great artwork including the three ways you could purchase each piece, please visit our Nebraska Conrhuskers YouTube video at www.youtube.com/watch?v=Si9wXqoiavg or go directly to the artwork website www.heritagesportsart.com/Nebraska-Cornhuskers-c87/ where you can see and purchase the artwork. Good work! I appreciate all the historical information, and links, and pictures. I am a big Husker fan ! !